While well-equipped minivans frequently top the $35,000 mark, the 2012 Kia Sedona minivan is significantly less expensive while still offering an impressive array of features. It is an IIHS Top Safety Pick, and it carries Kia's class-leading 10-year/100,000-mile warranty. 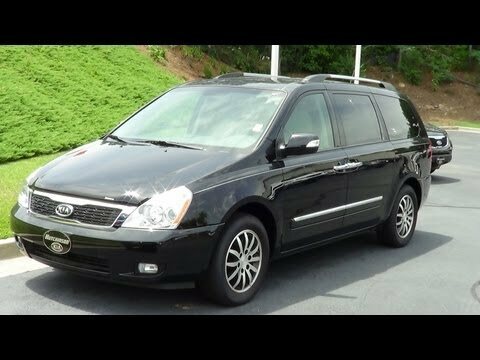 Kia Sedona is a great family vehicle! This vehicle has a lot of legroom. We have an adult son who is over 6' 8" and he can ride comfortably in the second row captains seat. Smooth ride with very little cabin noise. There is three third row seats so three young adults can fit comfortably with feeling extremely tight. The front console can go up or folded down. This was extremely important to me because I never leave the house without a large purse anew most vehicles require that you throw them in the back seat which does not work at all for me. Even when the console is up there is still room in the front to put my purse on the floor in front of the console. Nice deep trunk which allows seven people to get suitcases for travel without holding them on their lap. I can open both sliding doors with the remote control which is great if my hands are full or it is raining out. The Sedona has great pick up when entering the highway from the entrance ramps and gets about 23 miles to the gallon even in the extreme AZ heat or while driving through the mountains to get to cooler weather. My review of my 2012 Kia Sedona minivan. Its reliable, lots of recalls due to fires. I have issues with my tires a lot and the steering is kind of difficult to control. I like the way it is set up however. Also having issues with the wiring in my lights. I keep losing my low beam on the left and my high beam on the right and not to add that my tail lights go out very often as well. It is a good van just has issues. It has 7 seats available. It has air consisting and heat. It has a lot of issues. I have had to take it to a mechanic a lot. There has also been airbag issues with a recall. Other then that it has been okay. I have had this vehicle since 2012 and now in 2018 one of the sliding doors will not open. I have also had issues with both sliders with them not closing. Now the one will not even open.